[Twenty-one] years ago, our family occupied this site. I'm not absolutely certain what "ownership" means; my own tribe has behaved badly, in my own opinion, and I can only plead that that was before my time. And so here we are. I can quibble that our whole species is invasive on this continent, for what that's worth. I do know we Bears gave up what was, to us, a lot of money for fifteen years in order to be able to say the place is "ours," and I know that we have to give a certain sum to the local jurisdiction -- something called a "county" -- every year, or we could be put off the place. Yes, some of the bigger stems do in fact make acceptable non-weight-bearing polewood. They are bendy but if tied in bundles they will straighten over the winter. The stripped leaves can be composted. The trick with this is get it done before the flowering bits go to seed. Also, don't export any roots from the infested site. In Permaculture terms, what all did we do here? 1. Observe and Interact. We looked over the knotweed patch, and instead of attacking it with herbicides, chose to integrate it into the farm plan. 2. Catch and Store Energy. Practically all foliage is useful. It pulls sunlight into the realm of living things, and is useful to us, our livestock, and many living things. True for knotweed as much as anything else we could grow on that creek bank. Perhaps more so. 3. Obtain a yield. This stuff being prolific and invasive, you won't run out of it and so it can be thought of as a bountiful crop. 4. Apply Self Regulation and Accept Feedback. Make sure you aren't spreading it where it's not wanted. Check. 5. Use and Value Renewable Resources and Services. It can freeze back, but otherwise is as reliable as sunrise -- you can't get more renewable than that. 6. Produce No Waste. Compost whatever leaves are not consumed by stock, make beanpoles, make kindling, nothing left over! 7. Design From Patterns to Details. Make your poles in June, before the seeds appear. 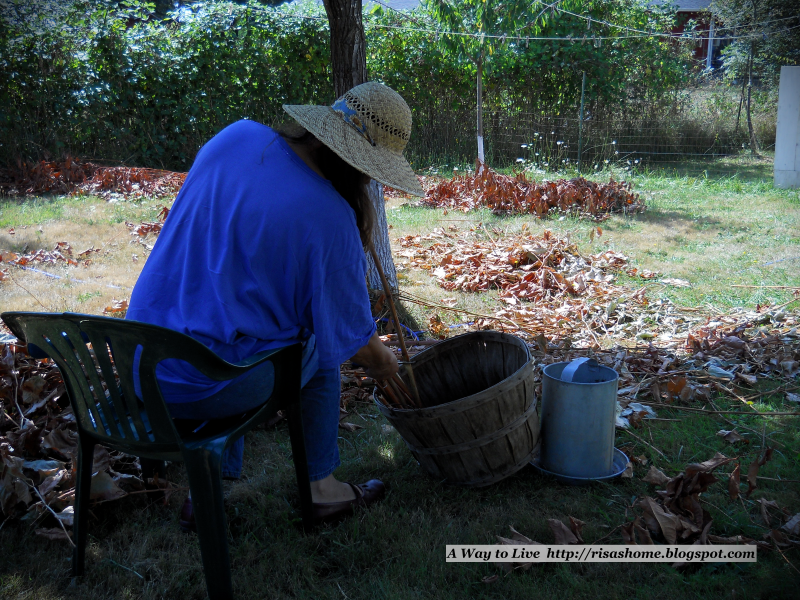 Make time in the schedule, after planting the garden, before other harvests. 8. Integrate Rather Than Segregate. Use it, don't poison it. 9. Use Small and Slow Solutions. 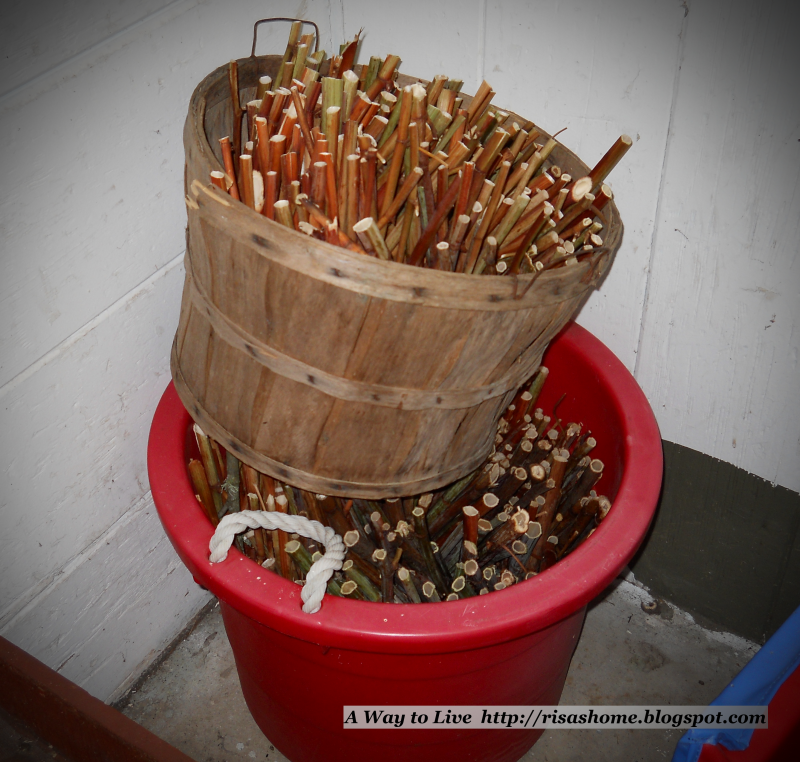 As beanpoles, the stems are biodegradable and can become kindling after their pole life is done. Process a few at a time, between other tasks, so as not to grow tired of it. 10. Use and Value Diversity. Knotweed is a supplement to other materials. Sapling beanpoles are also good -- fatwood is better kindling. Mix. 11. Use Edges and Value the Marginal. Knotweed, for us, grows mainly in our flood zone. 12. Creatively Use and Respond to Change. It was barely there when we noticed it. It got ahead of us -- things do. So we learned to live with it. The roses on the Rose Gate are a little more than half done for this year. When new branches spring out toward us or our guests, I tuck them back among their companions, thus building a shape we find pleasing. I don't know the variety; they were here when we got here 21 years ago. I moved the bush three times, but not to good places as it has a climbing habit. So the obvious thing was to split the root ball and plant on either side of the gate, where it's very happy. Warm days and cold nights. The garden did not mind my gamble to put things out early -- the pie cherries are ripening three weeks ahead of schedule -- but things grew to a certain height and just sat there. This week they're beginning to take off. The tomatoes, corn, beans and squash will do all right, by the look of them. It will, with any luck at all, also be a huge fruit year -- apples, pears, grapes and quince have set well. There are even medlars, goumi and aronia for the first time. As usual though, the stars of this farm are the roots and greens. The potato beds and bins look good. Here we have five kinds of kale, collards, Forellenschluss and Cracoviensis lettuces, red and green cabbages, red and green chard, tatsoi, bok choi, spinach, and turnips. A last year's chard and a kale have gone to seed, which I really want as they survived the -10F spell over the winter, a significant achievement even for them. Young Man has been here and emptied the duck pools, bucketing the water to the fruit trees, while I have taken on the long-put-off task of cleaning the garage. Spring can make me keep my head down and back bent a bit much, so it's good when The Cowboy can get away from his job and take me out on the water.